So we did what we usually do: rode bicycles to the property. Pedaling from Inzai to Sakura gives you a perspective you wouldn’t otherwise have if you drove or took the train. Inzai is still “developing,” as it were, and has been carefully planned; or, at least, more carefully planned than other cities in Chiba. The roads are wide and straight. Sidewalks provide ample bicycle lanes. Subdivisions do not encroach awkwardly on farmland or abundant tracts of forest–the satoyama dynamic holds for the most part. The commercial areas are well contained and laid out in a relatively efficient fashion. As you pass from Inzai to Sakura, these features slowly give way to the more common Japanese suburban clutter. The roads become narrower and sidewalks eventually disappear altogether. Houses and commercial buildings appear on top of one another. Main thoroughfares take forever to get where they’re going and if you really want to get there in a reasonable amount of time you have to constantly stop and check a map. Japan, as someone once told me, was custom made for GPS. I don’t mean to imply that Sakura doesn’t have its appeal. For one thing, it skirts a good portion of Inba-numa, the large lake-like body of water that various local governments have been wise and gracious enough to preserve in a mostly natural state. We’ve ridden often around the lake, which has a network of bike paths. It’s also popular among runners and joggers, and is the place where Olympic marathon medalist Naoko Takahashi did almost all of her training. In fact, the property we were inspecting is only about a ten-minute bike ride from the lake, in an older residential neighborhood whose closest train station is Usui on the Keisei Line. That said, by foot the station is 20-25 minutes from the property, over rather hilly terrain. This was of concern to us because, again, we don’t have a car so getting anywhere distant means taking this train. Presently, we can walk to Inzai Makinohara station in about 8 minutes, and while I don’t mind riding my bike to any station, the narrow roads and the hills make it more of a chore in Usui’s case. The property itself was quite interesting, though, which is why we wanted to see it. It is located on the edge of a subdivision at the bottom of a rather high hill. One of our criteria is firm ground, in terms of avoiding not just liquefaction in an earthquake but also general subsidence over time and more intense vibrations. We find out how high a particular property is above sea level by using topographical maps and software, since the higher the land the more stable it’s likely to be. This particular property is ten meters above sea level. The altitude where we live now is 25. 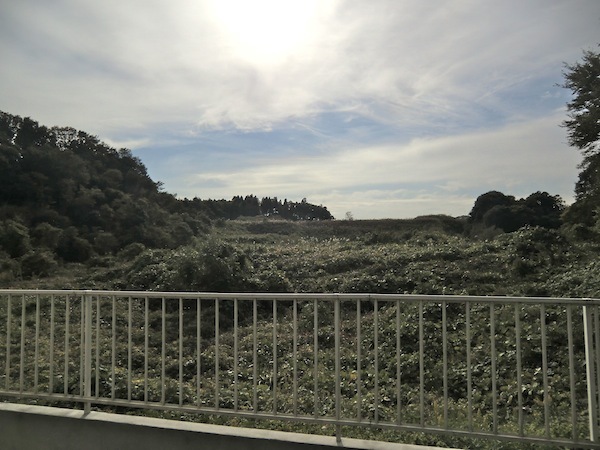 Sakura/Usui is on the same plateau as Inzai, but being closer to Inba-numa, which, as the name indicates, is more of a marsh than a lake, it is on a downslope toward the water. Ten meters isn’t bad but it’s difficult to tell if that’s ten meters of tableland or, say, five meters of tableland and five meters of dirt that has been trucked in from the top of some mountain in the middle of the Boso peninsula, which is a common situation throughout Chiba. As it turned out our realtor didn’t know, and we didn’t really expect him to. We’ve used him several times in the past and he’s familiar with what we want and has probably given up on us already. We’re sort of in a standoff with regard to accomplishing anything toward a sale: he doesn’t expect us to buy anything he shows us and we don’t expect him to know all the things we need to know in order to make a decision, such as the quality of the land underneath the house we’re looking at. One reason we tend to use this realtor rather than others (almost any property we look at will be listed on multiple real estate websites) is that his contract fees are smaller than others’, owing to the fact that he has no staff. He does everything himself. He’s also based in Sakura. There were two reasons we wanted to look at this house: layout and prospect. The house was built in the mid-90s and had two stories. The first was mostly open: a wide living-dining-kitchen area that took up the whole south side of the floor, with a small Japanese room on the north side and the bathroom facilities on the west side. The second floor almost mirrored the first. There were two bedrooms on the south side but they opened up on each other to essentially form one large room, and then on the north side there was another isolated bedroom. There was also a very large storage area/walk-in closet on the northwest corner. But it was the prospect that makes the layout work. To the south of the property there was nothing except an empty tract of land overgrown with vegetation, and the south side of the house had lots of windows to take advantage of the view–you could look out and see absolutely no one, not even another structure. This was doubly strange because the property was boxed in on all its remaining sides in the Japanese subdivision manner. The houses to the east and west weren’t more than five meters away, and the house to the north was separated only by the widths of two driveways that connected the properties to the public road and which were shared by five or six other properties. Despite the cramp, however, the house got plenty of unobstructed sunlight because of the way it was built. Whether it was a custom job we couldn’t tell and wouldn’t know right away because the realtor didn’t know either. After he arrived and parked in the very narrow space along the north side of the property he opened up the house and told us that it was owned by a different real estate company, which had bought it through a court auction, meaning the previous owners had lost it due to foreclosure. They had carried out some improvements and were now selling it. The most noticeable improvement was the exterior. We normally don’t like siding but this had recently been painted and looked fine. There was almost no empty land to speak of, only a narrow strip of dirt between the south side of the house and a short fence separating the property from the vast, empty tract that stretched off into the distance. The interior was even brighter than we expected, because unlike in most Japanese houses the north side was not reserved for the mizu-mawari functions–the kitchen and bathroom. There were windows on the north side as well, so the entire interior received plenty of ambient light. Even the bathroom had windows, which, instead of directly facing the house to the west, were positioned southward. Consequently they were completely transparent. The living-dining room had picture windows and a sliding door, as well as smaller windows arranged in the southwest corner, which was rounded in a kind of bay effect. We were pleasantly surprised to find that all the windows were double-glazed, which in our experience is quite unusual for a house built in the 90s. The Japanese room had obviously been recently remodeled, and not just with new tatami. The remodeling job did not include new floors, and while we weren’t crazy about the wood laminate flooring, it was better than most we had seen in houses of this particular age and was still in good condition. 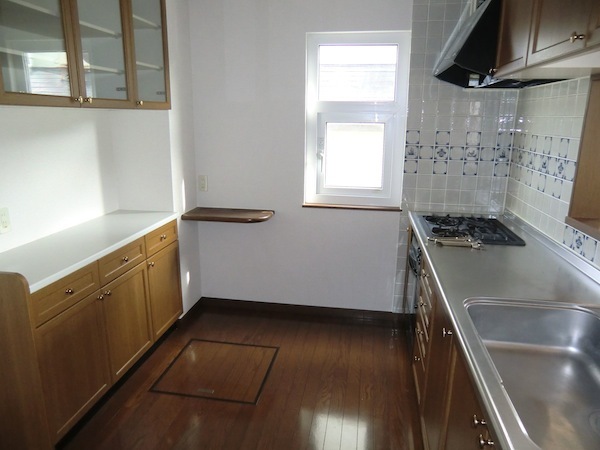 The kitchen was spacious and the wood cabinets better than tolerable. In short, though there were some things we would like to change, it was habitable as it was and would not require much more of an investment to suit our wants. But it also struck us as expensive given the location, the age, and the distance from the station: almost ¥15 million. Of course, we’ve been doing this long enough to know that a property is only worth as much as you yourself are willing to pay for it, but ¥15 million was a rather lofty position from which to start the bargaining, and again the realtor couldn’t help us since he wasn’t selling it himself. In fact, when we suggested he could maybe talk the other realtor down if we expressed an interest he became uncharacteristically blunt, telling us that the company was “scary” and that they would never budge from this price. It wasn’t as if he was going to make a big commission if he sold it to us. He said he wouldn’t charge us a commission, which would seem to indicate that the owner would pay him. In any case, he was next to useless in terms of giving us any more information about the house, like who lived there before or why the house had central air conditioning and not central heating (we suspect that this rare feature is one of the reasons for the high price, but we don’t use air conditioning ourselves, preferring proper ventilation in the summer). Obviously, we would have to negotiate directly with the other realtor, which means we would have to think the matter over carefully. $180K US? Sounds a winner. Should be able to go down from there in Japan, but you know better than I. Not likely to find a house with a better aspect, as most are dark rabbit hutches. Not using a/c in Kanto? That’s madness. Depending on the house, available shade, and obstructions to wind (such as other houses), it’s possible to be reasonably comfortable without a/c in Kanto. I live in Kumagaya, where it gets very hot, indeed, but have screened windows/doors on all four sides of the house. With shade trees, adjustable outdoor sunscreens, and occasional use of fans to assist when there’s no breeze whatsoever, I didn’t have to use the a/c at all last summer or the one before. I used it very sparingly in ’10, but could have done without if I’d really wanted to. Indeed. Aside from the price, sounds like a winner to me. 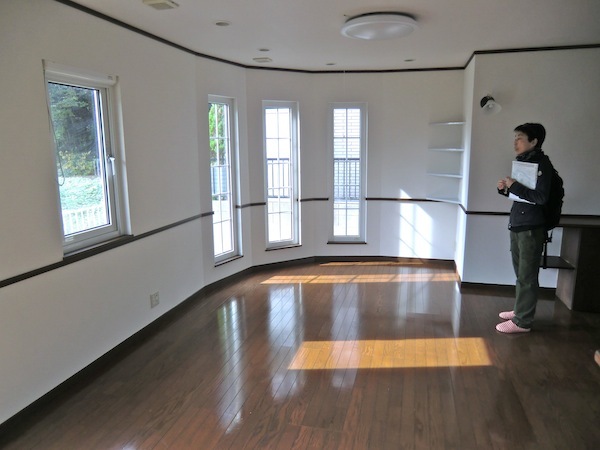 From the pictures, the house looks like it is in good condition and it’s really bright. Regarding liquefaction, is there a fault nearby? If the house was built in the 90s, the foundation should be good even if it is fill. It’s land that was filled a long time ago that I would worry about. I live in San Francisco. The 1991 earthquake caused a lot of damage in the Marina district, but that area was developed pre-1900s I believe. The ground there liquefied. On the other hand, Foster City was developed in 1950s(?) and the city is almost made entirely of fill. Foster City is about 30 miles closer to the epicenter yet there was no damage to buildings or to the underground utilities. Good luck. I have seen maps online of Tokyo high/medium/low risk of subsidence in earthquakes, No real estate agent will tell you about them of course, as half the country isn’t worth building on, but is. I’d find these for the area. Does it also have insulation in the walls? Of course not! Have you ever been in a Japanese house? There’s a bit of perspective distortion from the wide-angled lens – unavoidable if you want to include a reasonable amount of detail – so those interiors actually look a bit more spacious than they would probably be if you were standing in the space. I know Usui well as we live in Yotsukaido and are house hunting. Any idea how much is a reasonable expectation for an owner to lower the price? We’ve found that if the property is being sold by the party who presently/previously occupied it, that party tends to be more stubborn about price, probably because they aren’t completely understanding the reality of the market and their realtor hasn’t tried to bring them around. You tend to have better luck with realtors or other companies that buy the properties (or obtain them through court-sanctioned auctions) and then fix them up and sell them, since they have a better idea of what the place is really worth. But generally speaking the longer a property has been on the market the easier it will be to talk the price down, though often the price drops just through sheer force of gravity over time. 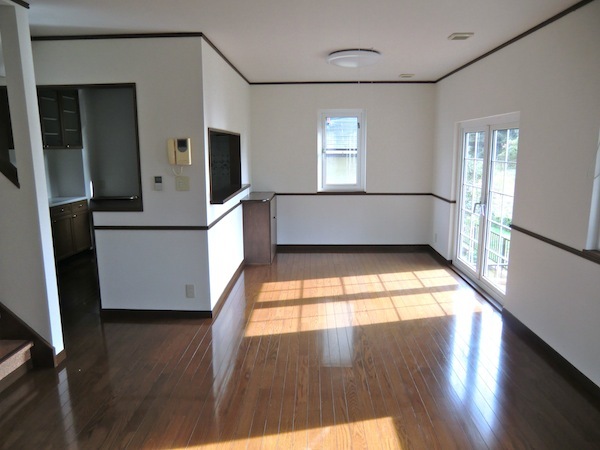 For instance, we were interested in a house in Onjuku last January but thought the ¥20 million price tag was too much. It has since come down to ¥15 million, probably owing to the discovery that in person it isn’t as good as it is in photographs. with Japan’s demographic decline I would expect that open prospect to remain that way, too! ¥15M seems eminently reasonable. You couldn’t now build what is there for only that much, right? I spent a total of ¥10M on rent alone, 1992-2000 in Tokyo, sigh. Actually, one of the reasons we think the place is a little pricey is that we’ve seen brand new houses being sold in the same area for a little over ¥20 million. With regard to your comment on rent, actually deep down we would prefer to keep renting, which may sound counterintuitive but the only real incentive for owning, at least for us, is that we don’t have a guaranteed income. If we did, we’d probably continue renting. Whatever we pay for a property outside of Tokyo is not going to come back to us in the future if we sell it. In fact, our main concern is whether or not we can sell it at all in the future. There is just going to be too many used properties. yes, I was semi-advising a friend who wanted to buy in early 2011. 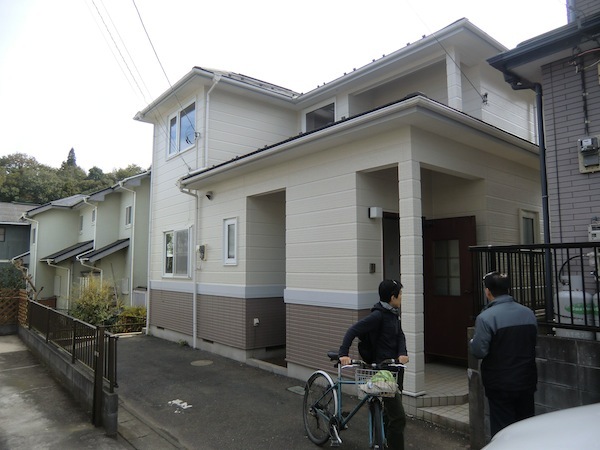 He and wife were renting for 15万 out on the Seibu-sen and were attracted to the idea of paying less per month on a ~3000万 brand-new house (which had a higher quality-of-life). My only advice was looking down the road a bit, say 2020. Tokyo may not depopulate as quickly as the sticks, but things are definitely slowing down already. . . ridership on the private lines is down a bit (2% IIRC). But my main thing is how land values will react to any major increase in the basic tax burden everyone faces. Rents and land values simply cannot go UP in response to a 15% GST or the end of all the low-tax stimulation attempts that have been going on since the 1990s. To pay off the quadrillion yen national debt (which is everybody’s savings in disguise), taxes simply have to go up . . . a lot! None of this is a recipe for higher land values & rents. But if the government just dumps a lot of money on everyone, then that could militate against lower housing costs. It is difficult to see the future. A large place with big windows is likely to be costly to heat in winter and difficult to keep cool in summer. See the comments to the “2011/05/24/wasted/” blog article as to why a relatively-new and efficient air conditioner can save a lot of money on heating bills. Thanks for the great blog and your JT columns! My wife and I recently returned to Japan after many years, currently staying with her mom in scenic Yamatokoriyama city in Nara. From mid Jan we have a 6 month work contract in Kawasaki. It might get renewed but we need to find an apartment from which we could bail after 6 mo if the job ends and we decide to return to Nara. UR seems to be the way to go because of no long term rental agreement, no commission etc etc. For UR, they told me you have to show proof you will have 30 man/ month income for a year. Since both of us will be working, I can show them a contract for a good bit more than 360 man even tho it’s only for a 6 months, so I think I’ll be good. If I had to I could put up a full year’s rent in lieu of their job or asset guarantees of financial ability (fwiw as I recall they would take proof of 10 million in assets if you don’t have income proof and can’t put up 1 year worth of rent). 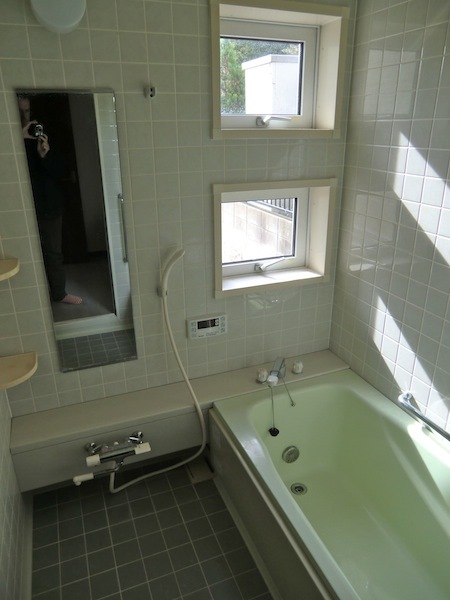 But there also seem to be some situations like decent small apartments or 1 floor of a small house, in the 7.5k yen range a e.g. in Noborito area along the Tamagawa. QUESTION: How hard/how much would it cost to get out of a 2 year rental agreement if I wanted to rent a privately owned rental and needed to sign for 2 years to get into a place, and then we want to leave after 6 or 12 months? Have you done any blog posts on this sort of question or know any other articles address this question? Economically, there are a lot of UR units in my commuting range but probably 12 man is the low end of the range, so e.g. verses a 7.5 man rental I might have 4.5 man/mo times 6 months or 27 man total difference in rent over 6 months, which would pay for 1 month realtor fee plus 1 month key money plus a few months extra to get out of the agreement if that is what it takes. So at exactly 6 months it might be a wash or even cheaper (vs 15 man UR apt) assuming that I could get out of the rental agreement by paying an extra 2 month rent. Is this doable wrt breaking the agreement? TIA if anybody knows much about this subject. Looks like a nice Japanese place. Never forget Japanese real estate has a negative resale value. Usually value =block minus demolition of existing structure. While the price is relatively low you would be burning 50% of your money as soon as you purchase. I like the way you cycle to these places good for you and good for the enivornment. Yes, we’re well aware of the negative resale value, which is sort of a sub-theme of this blog, anyway. Yes, you guys have a very clear perspective which makes your blog really worth reading. The Japanese RE market certainly is unique and any other potential buyers here would be quite well advised to read your blog. I can’t imagine I’d buy here anyway, but I learned a lot from reading your blog. I’d like to know the size of this place. A little hard to guess from the photo and description, and for me a key metric of comparative price. I wonder how much price gets discounted vs distance from the station. Walking is good for you but 25 minutes seems extreme! Man, I hate single glazed windows, they leak heat like crazy. I made a huge investment to replace all the windows in my 60’s era house in California. We also added and enlarged windows. Love the light, but you’ve got to have insulation too to the extent you have the windows. In California, even in a mostly rural county the code is quite stringent about energy efficiency – we had to add insulation under the floor to be able to add the windows we wanted, even with the best double glazed windows with inert gas inside. It doesn’t get below freezing that often, but it keeps the heat quite well. I suppose even in current new construction they are still not putting much insulation in the walls and attics here, or are they? Do they use double glazed windows as a standard or only in the high end? In Japan I’ve lived in lots of old, uninsulated places. The interior of the 4LDK house is 148 square meters. I’ve seen double-paned/glazed windows in even older condomiums where the the concern was less about energy conservation than it was about noise from a neighboring expressway. An interesting thing about buildings that are in the vicinity of an expressway .. if you can tolerate the increased noise and pollution (being higher up in a condominium helps alleviate the effect… is that the government (not sure if it is National and/or Tokyo Metropolitan) will provide both free safety inspections as well as generous subsidies for strengthening buildings for improved earthquake resistance. As a result, for many condominium owner cooperatives, there is an incentive to both accept the free safety inspections and undergo the costly (subsidized) restructuring work. Conversely, for most other condominium owner cooperatives, they are two barriers in place regarding earthquake resistance inspections. The first is that the cost of an inspection can be something like Y6 or Y8 million; plus, if something is found, not every owners’ cooperative has the necessary funds or mandate to undertake the necessary repairs. Therefore, as a result, many cooperatives simply don’t want to know. For potential buyers of used condominiums willing to forgo some of the inconveniences of living near an expressway in Tokyo, they may be able to find relative bargains on recently renovated condominiums. Well, that’s nice – bigger than I thought. 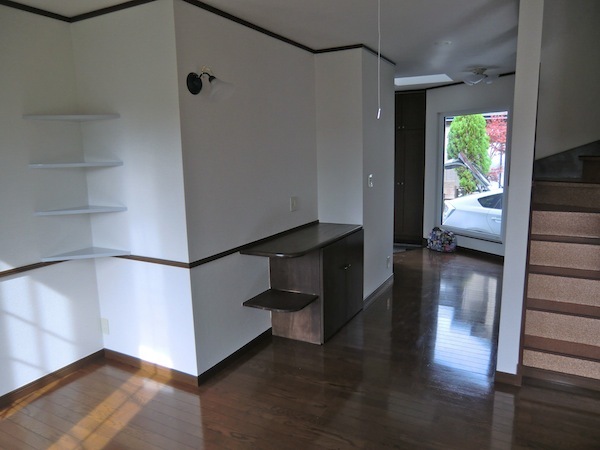 What does new construction cost in Japan for a place like this? Any benchmark on avg cost per sq m? 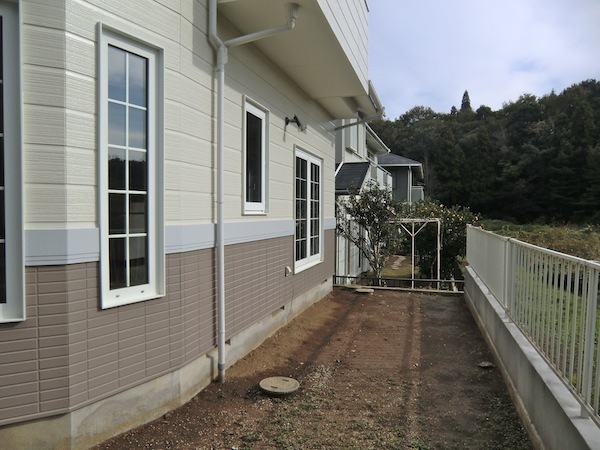 New house construction costs vary from ¥300,000 to ¥600,000 per tsubo (3.3 square meters) right now. This particular house was built in 1997 and we don’t know how much it cost. Thanks for the comment. With regard to the noise issue, we actually found that the higher up you are in a building, the worse the noise. We lived on the 24th floor of a 38-story building next to three train lines and a subway car barn, and the noise was at times so loud we couldn’t watch television. On the ground, however, the noise was less. The reason may have been the proximity of other high rises, meaning the sound bounced between buildings in an upward fashion, but it was already loud when we moved in and ours was the only high rise around. The size of the house is 103 square meters: 63 on the first floor and 40 on the second. Double-glazed windows are becoming more widespread in Japan but they are still considered something of an option. Insulation, however, has finally become a standard; or, at least, buyers now expect it. Has it really become a standard? This is interesting. There is no regulatory compulsion behind this though is there? I understood that a review was to be performed and would report by 2020. I wonder what the diffusion trend is, as well as the actual density and comparable performance against countries with proper building codes. If it is now standard I really don’t mind paying reikin to upgrade to a new flat that isn’t drafty as hell and freezing.